(Portland, Oregon) – Wind gusts over 40 mph and rainfall that exceeded four inches in some spots: it sounded more like the Oregon coast, but this was the record-breaking scene in Portland, SW Washington and the Willamette Valley areas over the weekend. (Above: downtown Portland on Sunday night). Steve Pierce, president of the Oregon Chapter of the American Meteorological Society, was as shocked as anyone at the numbers. Pierce called these numbers for rainfall numbers “simply staggering” for the month of September in this area. 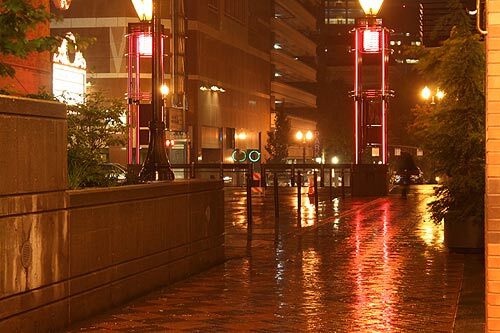 The records going back some 140 years were shattered fairly early in the weekend, with downtown Portland clocking in at more than seven inches during this month. He said the rainfall normal for Portland in September is about 1.5 inches. “More than seven major cities across Oregon and SW Washington have already set new all-time rainfall records for September including, Portland, Salem, Eugene, Astoria, Hillsboro in Oregon and Vancouver in Washington state." 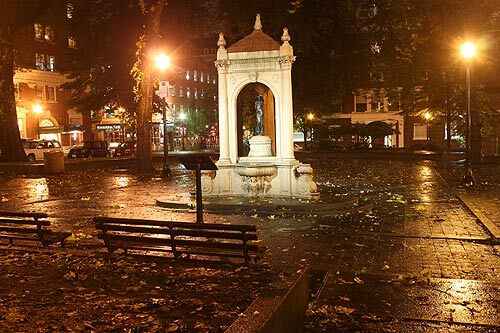 Astoria was closing in on one foot of rain for the month, with more than seven inches of that over the weekend's range of 72 hours. In downtown Portland, it was a weekend of blowing trees and leave-covered streets. Some residents lost power in parts of Multnomah County and Clackamas County, and a few downed trees caused some headaches. NE Portland reported a whopping 3.45 inches in that 72-hour period from Friday through Sunday. Hillsboro had 3.36 inches, the Willamette River at Oregon City had 2.76 inches. Really big numbers were reported in the Willamette Valley, including 3.38 inches in McMinnville, 3.13 inches in Salem, 3.6 inches in Corvallis and an impressive 4.27 inches in Springfield. Larch Mountain, in the Vancouver, Washington, area, had 5.29 inches.